The price of rice will rise by the end of the year. "It's going up, and the rice supply is getting tight for the rest of the year until the new crop in the U.S.," said Betty Matsumoto, an official with Hinode, a rice distributor, saying a $7.99 20-pound bag of rice in Hawaii is expected to cost about $10 by 2008's end. Roy Ishihara, vice president of operations for Marukai Corp., said prices of Japan's specialty food items have gone up because of the rising value of the Japanese yen. The rising rice cost is part of the worst food inflation in 17 years in the United States, and analysts expect new data due tomorrow to show it is getting worse. That is putting the squeeze on poor families and forcing bakeries, bagel shops and delis to explain price increases to their customers. NEW YORK » Steve Tarpin can bake a graham cracker crust in his sleep, but explaining why the price for his Key lime pies went from $20 to $25 required mastering a thornier topic: global economics. He recently wrote a letter to his customers and posted it near the cash register listing the factors: dairy prices driven higher by conglomerates buying up milk supplies, heat waves in Europe and California, demand from emerging markets and the weak dollar. The owner of Steve's Authentic Key Lime Pies in Brooklyn said he did not want customers thinking he was "jacking up prices because I have a unique product." The United States is wrestling with the worst food inflation in 17 years, and analysts expect new data due tomorrow to show it is getting worse. That is putting the squeeze on poor families and forcing bakeries, bagel shops and delis to explain price increases to their customers. 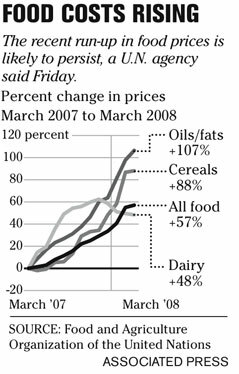 U.S. food prices rose 4 percent in 2007, compared with an average 2.5 percent annual rise for the past 15 years, according to the U.S. Department of Agriculture. And the agency says 2008 could be worse, with a rise of as much as 4.5 percent. Analysts are forecasting that tomorrow's Department of Labor report will show the Consumer Price Index rose at a 4 percent annual rate in the first three months of the year, up from last year's overall rise of 2.8 percent. "I was talking to people who make $9 an hour, talking about how they might save $5 a week," said Kathleen DiChiara, president and chief executive officer of the Community FoodBank of New Jersey. "They really felt they couldn't. That was before. Now they have to." For some, that means adding an extra cup of water to their soup, watering down their milk or giving their children soda because it is cheaper than milk, DiChiara said. U.S. households still spend a smaller chunk of their expenses for food than in any other country -- 7.2 percent in 2006, according to the USDA. By contrast, the figure was 22 percent in Poland and more than 40 percent in Egypt and Vietnam. Still, the higher U.S. prices seem eye-popping after years of low inflation. Eggs cost 25 percent more in February than they did a year ago, according to the USDA. Milk and other dairy products jumped 13 percent; chicken and other poultry, nearly 7 percent. The other reasons are more complex. Rapid economic growth in China and India has increased demand for meat there, and exports of U.S. products, such as corn, have set records as the weak dollar has made them cheaper. That has lowered the supply of corn available for sale in the United States, raising prices here. Ethanol production has diverted corn from dinner tables and into fuel tanks.